If you research the Goldendoodle you will find “buzz” words like; “lovable, social, friendly, non-aggressive, and extremely intuitive” (that’s my personal favorite). You will also read statements like: “Their intelligence and high trainability make them well suited for guide dogs, therapy dogs, and other types of assistance dogs.” I can honestly tell you – this is the truth! I am blessed to have my 94 year old mother less than 20 minutes away from us. 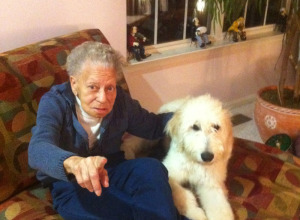 Originally a native New Yorker, she now resides in a cozy and very caring Assisted Living Facility where the caregivers dedicate plenty of time providing generous portions of attention towards stimulating her memory – she has dementia. I know we’ve all heard the word, but please allow me to tell you exactly what it is: “Dementia is a chronic or persistent disorder of the mental process caused by either brain disease or injury and becomes marked by memory disorders, personality changes, and impaired reasoning”. My mom (whom we affectionately call “Angel”), exhibits most of these symptoms, but not all the time. When she comes to our house, I become addicted to simply watching her and “the boys” interact. The three of them seem to communicate in their own little language that requires only glances and stares. It is as if they understand the depth (or lack thereof) of her mental capacity, the frailty of her teeny tiny body, and the difficulty she seems to have with communication most of the time. 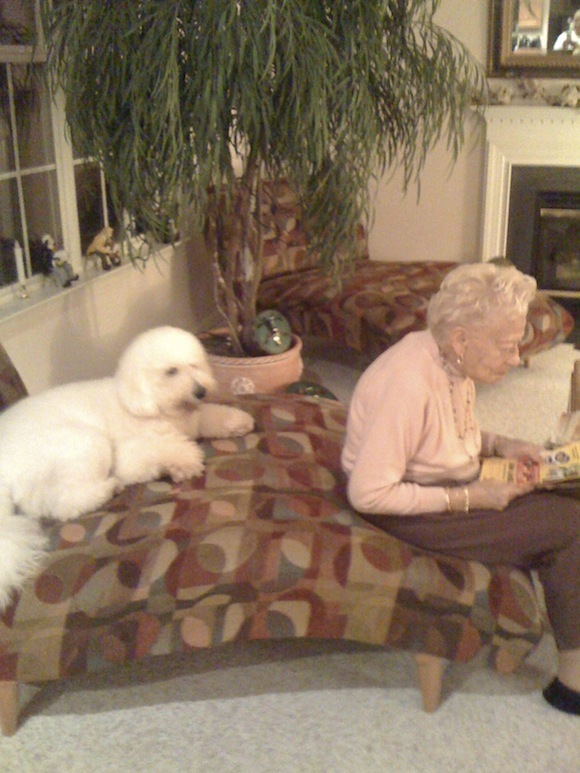 I’ve read about “therapy dogs” and how they can “stimulate social interaction and ease agitation in dementia patients”. But it also requires “specially trained pets to bring the full benefit of animal therapy into elder care settings”. I know my two aren’t “therapy trained”, but I am convinced they are “wired” with the right spirit! 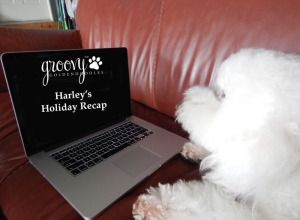 Both Harley and Leo can be rather rambunctious around the house, especially if the weather hasn’t been cooperative, subsequently eliminating walks and romps in the yard. They are dogs, and not small ones either, so you can only imagine when the running starts, and they start racing each other up and down the stairs, chasing their tails, wrestling on the floor, you get the picture – we all sometimes just get out of their way until they stop! 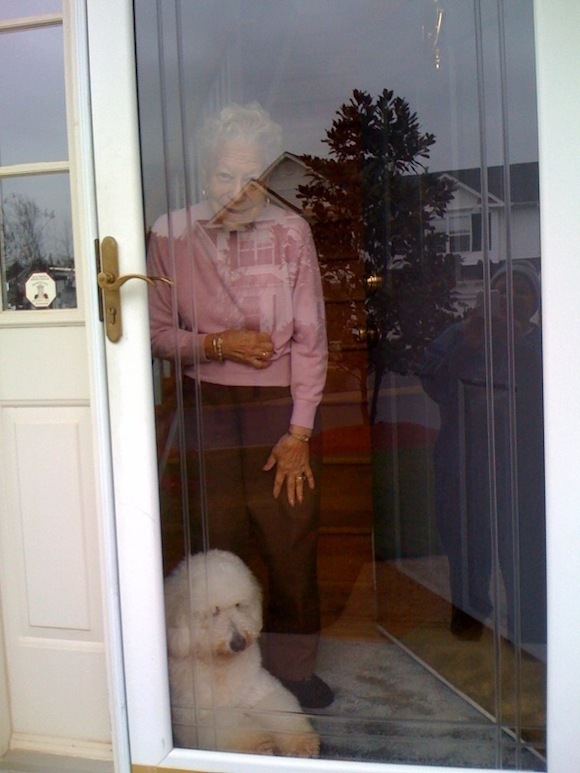 The first time my mom came over after Leo arrived, I was a nervous wreck, when we got to the front door, all you heard were three different voices (our daughter was home) giving commands: “sit – stay – down – easy”. I was impressed because once I opened the door, they were sitting there, tails wagging like dust mops but sitting none the less. She came in and petted them both on the head and said “hello Poochie-Poochie”, and preceded into the family room. I had her left side, my husband her right (for balance) and my daughter pulling up the rear as a buffer should the two of us fail if she fell. It wasn’t until I got her to the couch that I realized the welcoming committee was missing. They were at the end of the hall, peeping around the wall watching. I laughed and told them they could come in, and they walked, slowly, with purpose, as if deliberately not wanting to startle her. The rest of the day, and all visits thereafter, they are unbelievably different dogs when she is around – like “model citizens”. On her good days, she can maneuver around with her three pronged cane, but still, she’s not the steadiest person on the move. We guide her from a distance, allowing her the independence she so desperately craves, no matter how small the activity. If they are laying down in her path, you are convinced they’ve developed deductive reasoning. If they move out of her way, it is precisioned (almost in slow motion) like a marching band on a football field. If they remain in their spot, they lay still like corpses, I mean nothing even twitches. I hold my breath because she is placing that cane, and her feet between legs, tails, and I just know any second, someones gonna jump, and then the cane is gonna fly then I’m gonna dive to grab her before she goes down, and every time, I am wrong! They patiently wait until she’s cleared the area! Simply amazing. If she drops something, anything, food, a tissue, it doesn’t matter, she wants to pick it up and they will not bother it or her. They make sure she’s never alone. She tells them what she’s doing, where she’s going (could be from one room to another) and there they go! One day I needed to ride to CVS to pick up a prescription, It was a messy rainy day, so I opted not to take her with me, plus I was only going up the street. As she walked me to the door, I told her I would be right back. She walked with me and told me she and “Poochie – Poochie” would wait for me! As I backed out of the driveway she and Harley were standing in the doorway, I drove to the drugstore and 10 minutes later when I pulled back into the driveway, as promised they were both still there! My mom struggles with my name, talks a lot to me about me, will confuse my daughter as my sister, and thinks my son is a “nice young man”, but she knows “Poochie-Poochie” and they always bring a smile to her face. So I guess I answered my own question…. YES! Angel has Angels! PS: Back to blogging twice a week – Monday & Thursday, so subscribe for updates! Great Post Cathy. Mama looks good.